Despite sweeping headlines claiming the Benghazi rebel terrorists have shifted their leadership over to Tripoli after continuous claims of the city falling to rebels after over a week of continuous fighting, BBC has slipped out the fact that this claim is a verified lie. Buried within an article titled, "Horror scenes at Tripoli hospital," BBC conceded that the rebels have constructed a makeshift landing strip in the western Nafusa mountains where they are "reported to be staying," only visiting Tripoli in daytime for quick photo opportunities. The article continues by also conceding the self-proclaimed, unelected leader of the rebels, Abdul Jalil and "other key leaders" are staying in the east because of "the lack of security in Tripoli." That is of course when these "key leaders" aren't groveling in Doha, Paris, and Rome before their Western sponsors. In another disturbing development, it appears that the rebels control a single concentration of troops within Tripoli that are scrambling from one NATO designated objective to another, streaming in after aerial bombardments on civilian infrastructure and leaving in their wake mass murder and complete social dysfunction. A hospital in the previously government controlled Abu Silem district has been abandoned after a NATO bombardment followed by rebel advances. NATO bombs also destroyed a local fire station and there are now reports of black Africans turning up in large numbers, dead, in hospitals. 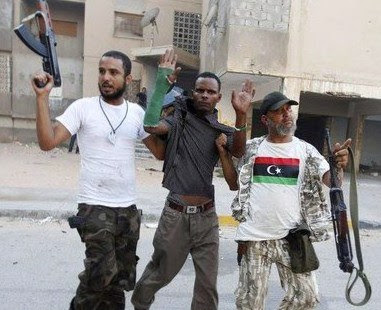 While BBC has officially written them off as "suspected mercenaries," it should be noted that just like every nation on earth, Libya's population includes diverse demographics, and considering its location on the continent of Africa, many black citizens. Photo: Images and reports are beginning to trickle in as NATO-backed genocide unfolds throughout Tripoli's streets, indicating the destruction of infrastructure and the specific targeting of black Africans written off by the corporate media as "suspected mercenaries." Benghazi rebels have been long reported to harbor extremist ideologies and an intense ethnic & racial hatred. Respected geopolitical analyst Dr. Webster Tarpley has long warned from the beginning of NATO's operations in Libya that Benghazi's rebel terrorists harbor vicious racial and ethnic hatreds that were manifesting themselves in brazen atrocities as NATO helped them move westward toward Tripoli. Corporate funded human rights organizations were force to recognize this alarming trend, though their reports were mostly muted, and in conjunction with corporate media spin, obfuscated from public scrutiny and debate. It should be remembered that the UK, US, France, and Qatar have all admitted their special forces and intelligence agencies were on the ground leading these very rebels. This means that not only are these atrocities taking place at the hands of rebels receiving NATO air support, funding, weapons, and political recognition, they are taking place at the hands of rebel militants literally led on the ground by NATO forces themselves. For more on verified reports regarding the Benghazi rebels' atrocities please see "Libyan War Gets Weird," "Libya's Not-so-Noble Rebels," "Al Qaeda: Pawns of CIA Insurrection from Libya to Yemen," and "The CIA’s Libya Rebels: The Same Terrorists who Killed US, NATO Troops in Iraq."